Breed Group: Toy Weight: 6-8kgs Height: 30-32 cms Color(s): blue and tan. 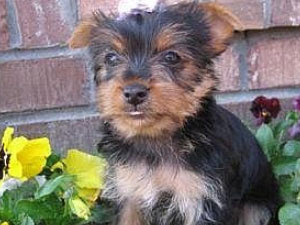 Yorkshire Terriers are born black, gradually attaining their blue and tan coloration as they mature. Coat: The Yorkshire Terrier's coat is not coarse, but is fine and silky to the touch. Unlike other breeds, which have fur, the Yorkshire has hair that is growing constantly. They have no undercoat and do not shed. Distinct feature: This dog is intelligent, lively, and fearless. They focus entirely on their owner and are extremely affectionate. It has been said that a Yorkshire Terrier requires more human companionship Temperament: The Yorkshire Terrier can be territorial and likes to have their space respected. They are tolerant of older children if treated with care. The Yorkshire Terrier can also be somewhat independent and assertive. They get along well with other pets. Activity: The Yorkshire Terrier requires minimal exercise. They are suited for short walks and ideal for apartment living or homes with small yards. They love to chase shadows, lay in sunbeams, and tug of war. The more attention this breed receives the better.